Choosing the best app development company for your software solutions needs is no cakewalk. The process often seems slow and tiring with the scores of companies thriving and springing up in the IT industry. When a business wants to launch an application successfully, picking up the best app developers for custom software development is the most crucial step. You need an app development agency that will convert your idea into a reality. Most businesses look for references and ask their peers about their reviews for various IT software development apps, but that is just the traditional way to go about it. Searching via professional network – If you have a great network of professionals who may help you find the best app development company, ask them! As the rule of thumb, the best app developers are hard to find, but the task can be made easier when you look through your professional contacts and inform them about your needs, asking for references. Digging Social Media– It is imperative that you check the social media presence of all the companies you consider partnering with for your app development needs. The best companies with have a consistent presence across social media platforms, and you will be able to narrow down your options further. 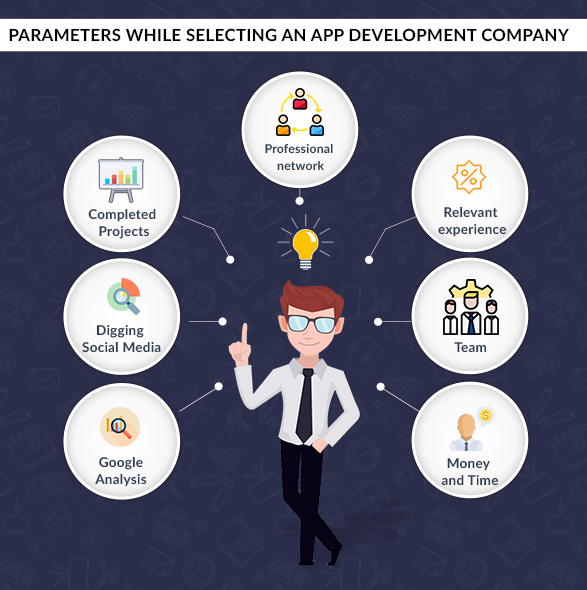 Google – The findings of the search engine are enough to tell you about any app development company you may have shortlisted. Look for a complete Google profile as the first measure of the authenticity and the sincerity of the company. Next, the reviews on Google don’t lie. You will get to know what the company’s clients, employees, etc., say and think about it. Completed Projects – This is the most basic and foundation measure of any custom software development company. You can get to know about the past projects the agency has successfully delivered, the areas of IT software development that the agency spans, and their testimonials. Relevant experience – While the list of projects any software development company has completed over its years will let you know the breadth of their services, looking into a specific experience will give you an idea about the depth of its services. It makes sense to ask how many E-commerce websites or mobile apps, and with what functionalities any organisation has developed and delivered if you are looking for similar services. The team – An organisation is nothing but the employees who synergize their experiences and skills to deliver services. Look at the profiles and the expertise of the team members if you want to know what an organisation is capable of delivering. While the quantity doesn’t matter much, the quality of the members should be top-notch for the company to be excellent at what it does. Money and Time< – If you really want to partner with the best app development company, you need to understand it is not going to be cheap. The best app developers know they are best, and you need to pay them the best prices. However, when the duration of the project is considered, it depends on your requirements and any company who is unable to strategize and plan and give you a deadline should be neglected. Maintenance and Support – These two services are really the ones that matter after all of the above is checked and confirmed. The software development agencies that provide quick support and maintenance services are the ones that are reliable and trustworthy. Often, apps need minor fixes and up-gradations after they have been delivered. To get these tweaks done by the experts, you need a long-term association with the right company which is committed to offering value to its clients. Another standout factor that truly differentiates companies is whether they are global or have not yet made it to the international picture. CDN Solutions Group is one app development company that satisfies all of the above criteria, while also being a regular to international events. We are a part of all major industry-leading events and conferences, and this is where we find the motivation to work hard and deliver consistent value in the IT industry. We are an app development company that looks for innovation and experimentation. Confirming this notion about us is the fact that we are joining industry leaders and experts at CeBIT Australia 2018. The week-long event will house some of the best business technology leaders from, literally, around the world. We are one of the companies exhibiting at CeBIT Aus 2018 with our expertise and experience. With our industry experience and breadth and depth of our services, we are sure to come out as a standout app development company in CeBIT Aus 2018. Meet us at our stand number E12, cloud zone! We are ready to make a difference!